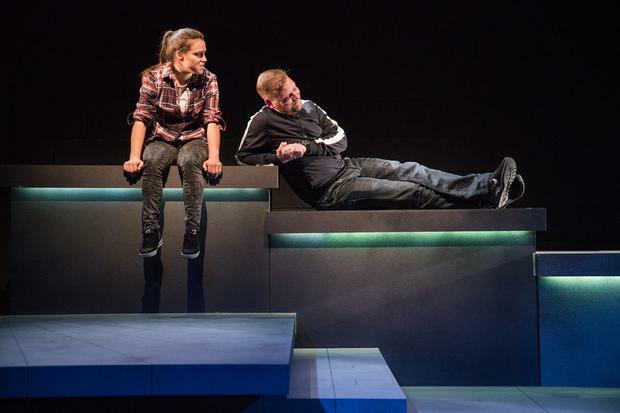 Fishamble’s latest play tells the story of Maz (Eva O’Connor), a young woman attending a pro-choice march, and Bricks (Stephen Jones), a Tallaght father on his way to pick up his four-year-old daughter. The two meet on the Luas, and as the day unfolds, form an unlikely bond. Maz and Bricks variously challenge each other in bristly conversation and speak to the audience in rhyming monologues. And yet, they seem to be in different plays. 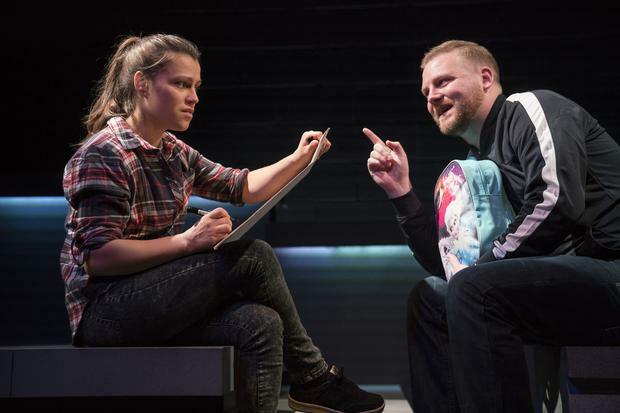 O’Connor, who wrote the play, gives Jones all the best lines, and he easily steals the show with excruciatingly funny jibes and impressions of his ex-girlfriend, his brother and even his daughter, which manages to be only a little ridiculous. Maz, by contrast, is far less engaging. While Bricks is allowed to be playful, angry, sad and frustrated, Maz has two modes: snapping rage or histrionic misery. She’s a deeply unsympathetic character, relying on an inevitably tragic backstory. O’Connor has a powerful skill for delivering searing monologues, but the success of the play rests on the strength of the two characters on stage, and there is a striking imbalance. The set, designed by Maree Kearns, is spare, a spread of tiered platforms with neon underlighting. It can make the space seem more dynamic as they walk around the city, but the sound and lighting act as cues for the audience rather than giving any real or immersive sense of where the scene takes place. The play is let down by a disappointingly convenient ending, playing as poignancy-by-numbers. Jones’ performance alone, however, is worth the ticket price.